For part 2, independent filmmaker Sixto Melendez and I look back to the good and bad of filming a feature film, and forward to the future. Click here for part 1. What was your most challenging day while filming The Conduit, and how did you overcome it? Through some connections in the town of Globe, AZ, where we shot 90% of the film, we were allowed use of a conference room in a local hospital for a couple of days. The plan was to shoot two different scenes that occur at different places in the narrative during the movie. One takes place earlier in the film and the other is non-consecutive and takes place much later in the film. The scenes involved group therapy sessions where our troubled protagonist meets his opportunistic antagonist and their lives become connected. Anyway, we had our cast, a number of extras. Among our cast we had an actress playing the therapist that was leading the sessions. Well, the first scene went off without any major issues of note and we got it "in the can" as we filmmakers say. However, when we went back to shoot the second scene, the actress who played the therapist on the morning of the shoot informed us that she would not be able to get back to Globe from Phoenix where she was from. We jumped through a number of hoops to get use of the hospital conference room and we knew there was no way we'd be able to arrange for another day within our schedule. The clock was ticking and we were playing phone tag with this actress, begging, pleading, crying, stressing out but at the end of the day we finally had to accept the fact that she was not going to make it. We were about to lose the day and our only option was to replace her, but we had already shot her in the other scene so we would potentially have to re-shoot that scene as well, which would have been impossible. It wasn't just getting the hospital location but also coordinating all of the extras who had already been shot in the previous scene. After much stressing and time lost, we finally decided to move forward with another actress that we found on extremely short notice. As for the continuity of the two scenes with different actresses playing the therapist … I simply chalked it up to the notion that this is an ongoing therapy group that meets regularly and will often have different therapists in the lead. I think I got an ulcer just recalling this. Conversely, what day was the most fun? It was a while ago, but one night stands out in my mind as particularly exciting. We were shooting a small but pivotal scene where our protagonist Eddie (played by Wes Martinez), after much difficulty and confusion, finally turns to the mysterious character Gabriel (played by Mike Watkiss) that has been stalking him for answers. In the scene, Gabriel enlightens him on the mysterious backstory of the femme fatal who is tormenting him. The scene was very small and simple. Just two characters, one small room, and a broken down shed where the character Gabriel lives. We had a very small skeleton crew, just me directing, Javi our DP, and Eric our sound recorder. As writers we put word on the page, describing the images we see in our minds as we try to convey a narrative to the viewer. Our minds can fool us sometimes because what we are trying to express is clear in our minds so while it makes narrative sense to us in our own heads, what we put on paper and eventually on the screen doesn't always translate as you imagined. However, when it does and when two of your strongest actors begin to deliver a scene and the chemistry between them is working and the scene is already working and coming to life right before your eyes, before you've done any of the cutting or sound design, or color grading or any of the post effects that you will eventually add, there's just an amazing, fulfilling sense of gratification that I wish I could bottle and sell. Sometimes when you're shooting and everything is just falling into place, the actors are delivering, the crew is functioning smoothly and things are going as they should – you can already sense it working. Rather than hearing the voice in your head ask "Will it cut together?" the voice actually changes and says "I can't wait to cut this together!" Because you just know that it's working and you're capturing a moment. Shooting this scene was one of those special moments that I'll always treasure. Now that The Conduit has been released, I assume you're conceiving your next film. What are you thinking about doing next? I have an idea that I'm kicking around, but it's a pretty deep spiritual idea that I have not quite found my path with yet. So, I don't want to divulge too much. It has to do with altered states of consciousness and a spiritual quest seemingly gone awry. I need to have an altered state experience before I will allow myself to write a script because I do believe in writing what you know, or at least have enough experience or good research to speak with some level of understanding and not just dream things up. If money was no object and you could choose any actors/actresses you wanted for your cast, what would be your dream film to make? The idea that I mentioned above is a one that I would love to see developed and executed with a real budget as opposed to the shoe-string on which we made "The Conduit". I'm taking lots of notes and compiling my thoughts at this time but I am not ready to tackle the script just yet. Although I am getting close to possibly starting a rough treatment. In my head, I imagine Jake Gyllenhaal in the lead. I've been drawn to him as an actor since Donnie Darko, and this idea that I am kicking around is similar in that it deals with cosmic mysteries. I'm not sure what it is about him. He's definitely a solid actor but there's an everyman quality about him that I appreciate, especially for a character like this. A grown man able to make his own choices yet on some level young enough to make the wrong choices. I'm not sure if that truly sums up the qualities I like about him but at the moment that's what comes to mind. And honestly, if I found myself on a set directing Jake Gyllenhaal, I would have to take a moment to revel in the moment because he's definitely an A-list movie star, so if ever I'm lucky enough to find myself in that situation I'll be able to say "I made it." For now, it's nice little fantasy. It's important to dream. 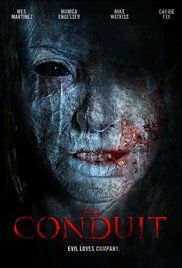 And to buy the Conduit, visit Brain Damage Films. Thank you for reading. If you enjoyed this article, please consider sharing it via your favourite social media, leaving a comment below, and signing up to receive new posts by eMail.